Interview by Hamline alum Mark Ceilley (MFAC ’12). 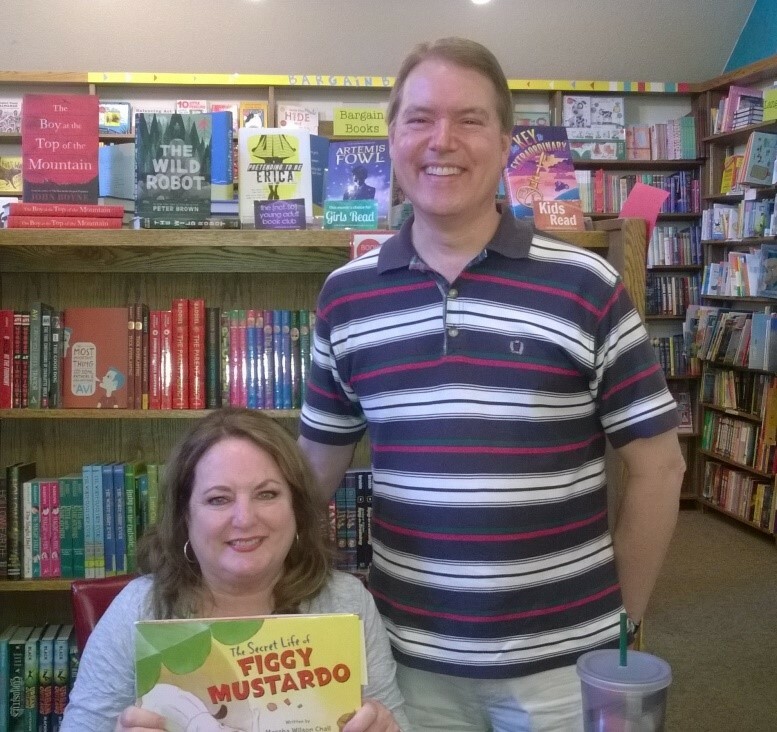 Today I have the honor of interviewing Marsha Wilson Chall, the author of the new picture book, The Secret Life of Figgy Mustardo, and her editor, Jill Davis. Marsha Wilson Chall grew up an only child in Minnesota, where her father told her the best stories. The author of many picture books, including Up North at the Cabin, One Pup’s Up, and Pick a Pup. Marsha teaches writing at Hamline University’s MFAC program in St. Paul, Minnesota. She lives on a small farm west of Minneapolis with her husband, dog, barn cats, and books. Marsha: You’re right that this story evolved differently than my others. My amazing editor, Jill Davis, sent me Alison Friend’s thumbnails of an adorable canine character she had named Figgy Mustardo in a variety of human-like poses and costumes. For me, it was love at first sight! So I set about the process of creating Figgy’s story based on my impressions of him through Alison’s art and then, via Jill, Alison’s written notions of his characterization and story ideas. I also had to think about the nuts and bolts of how Figgy might transform from dog to dilettante. I was fairly certain of my own dog’s boredom and loneliness while our family is away, so I started my story exploration there. We all know that dogs, as social creatures, dislike being left alone and are often fraught with anxiety leading to certain not-so-flattering behaviors and/or the escape of sleep. A story with a sleeping dog would not be too interesting, so I chose the much more exciting, destructive route. What if Figgy ate things–any things–in his frustration, fell asleep, and dreamed about himself as a manifestation of what he ate? We all know “you are what you eat,” so in Figgy’s case, for example, he eats Mrs. Mustardo’s Bone Appetit magazine, falls asleep, and dreams of being Italian Pizza Chef Mustardo serving Muttsarello and Figaro pizzas to adoring gourmands. When he wakes, he knows his dream is a sign, so he makes a real one of his own, “Free Pizza,” and serves his entire animal neighborhood at Figgy’s Pizzeria. Most importantly, I needed to develop a motivation for Figgy’s adventures; how were these events connected to him? What did they mean? How would they affect Figgy’s world outside and inside? The answer arrived in the form of loss; every animal neighbor came to Figgy’s concert and pizzeria and car race except Figgy’s family, the Mustardos, especially George (his boy). In desperation, Figgy creates the sign “Free Dog” to find a family who will talk and walk and play with him like all the other families he sees through his window. Where are the Mustardos? The family Mustardo arrives in time to show Figgy how much they care with a promise to take him wherever they can and to provide him companionship when they can’t in the form of new pup named Dot. Figgy and Dot go on to enliven the neighborhood with Free Shows nightly. Marsha: Once I knew my character and his problem, I dashed off the story, sent it to Jill who loved it at first sight, then sat back satisfied with a good day’s work. Ha! Not the way it happened, but I did write a first draft within a few days that Jill found promising. So many drafts later that I can’t even recall the original, Jill exercised plenty of patience waiting for the story she and Alison hoped I could write. I know she’ll protest my tribute, but I have never worked with an editor so open to my trial and error. Her abundant humor carried us through the process that I think would have otherwise overwhelmed me. Marsha: Figgy hopes so and so do Jill, Alison, and I. For now, I hope Figgy wags his way into the hands and hearts of many human friends where he belongs. Jill: It was kind of hard. The illustrator had invented this little dog who she wanted to be an adventurer—yet she wasn’t sure how to make the story happen. When I saw the dog, I thought of Marsha’s One Pup’s Up—and I knew how talented she was. Seemed like a slam dunk! But all of us—Marsha, myself, and the illustrator, Alison Friend had to share plenty of feedback, edit, and revise a bit before Marsha was able to tell both the story she envisioned as well as the story Alison had in mind. Marsha pictured Figgy at home, and really loved the idea of using signs. Alison seemed to feel Figgy was some kind of James Bond. So how were those two visions going to meet? They finally did when Marsha realized that Figgy would go to sleep and dream about his exciting alter-ego. And we all loved the idea. The book may seem a little bit sad because Figgy is always being left at home, but Marsha told it in such a great way, that Figgy showed his grit! If he’s hungry, he eats what’s there—but then the magic happens and he goes to sleep and dreams of something related to what he ate. It’s so fun and so imaginative. 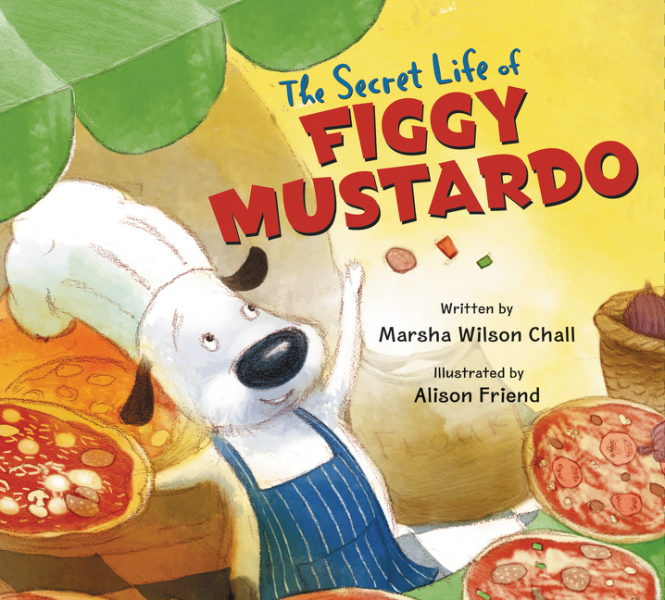 I love what Marsha did with Figgy’s story, and Alison did, too. There were times when she should have been frustrated or wanted to spit at me, but she was cool as a cucumber in the freezer in the North Pole. So professional and what I loved also about working with her is how much I learned: a lot. I learned how she makes use of repetition, alliteration, and very careful editing. I can be sloppy, but Marsha walked straight out of Strunk and White. She’s exact and wonderfully detail oriented. She was also involved at the sketch stage. Actually at several sketch stages. We worked on the phone, we worked at Hamline, and we worked until we thought it felt perfect. And she loved it because she could use it in her teaching! And I just loved working with Marsha! "Marsha walked right out of Strunk and White." I worked with Marsha on my critical thesis, so I have to say, this quote is spot on. (and I'm already worried that my commas in this comment are in the wrong place) Great interview Mark! Thank you, Mark, for a great interview. Such fun to read about the collaboration of the talented Marsha and Jill.